Seven friends come face-to-face with a demonic Swedish legend while on holiday at a cabin in the woods. While carrying a shotgun through the forest, Gunnar calls for his daughter Lisa. When he finds her, Lisa is being eaten by her mother, who has turned into some sort of creature. Gunnar shoots his wife in the head. Ida and Albin have dinner with Albin’s parents. Albin’s father tells his son about an abandoned cabin that he and his friends can use for their holiday weekend. Ida’s friend Linnea asks Ida to bring her womanizing brother Simon to the cabin because she is attracted to him. Ida is reluctant at first, but she agrees. Ida and Linnea take a car to the cabin with their female friends Tove and Marie. Albin and his friend Markus pick up Simon in the other car. At the cabin, the group sees Gunnar watching them from the woods, but he refuses to speak to them. Albin discovers that the front door is locked. Markus recruits Marie to scare Albin by sneaking in through a side window and jumping at him from inside. While exploring the cabin alone, Marie finds a door in the floor. She descends a ladder and walks into a dark tunnel. Albin and the others eventually open the front door. Marie is found standing solemnly behind another door. Markus explains that she was part of his prank, but Marie does not move or say anything. Simon and Tove break from the group and go to an upstairs bedroom. Markus asks Marie why she did not scare Albin. Marie claims that she is not feeling well. At the dinner table, Marie feels ill when she recalls confronting a hideous woman in the underground passage and becoming possessed. Marie excuses herself to the bathroom where she urinates blood before collapsing on the floor. After Marie fully succumbs to the Vaettr’s possession, Tove finds her at the top of the staircase where she proceeds to bite off Tove’s upper lip. Marie spits blood on Linnea’s face before Simon is able to punch out Marie and restrain her. Gunnar comes to the door and insists that he be let inside. After examining Marie, Gunnar tells the group about his trip to the woods with his wife Karin and daughter Lisa. Karin and Lisa changed after they discovered the cabin while searching for mushrooms. Gunnar tells everyone a story that his grandfather told him as a child about a legendary creature that lives underground and forbids trespassing on its lands. The creatures can take your soul if you gaze at them for too long. Gunnar recommends burning Marie, claiming that she is already dead. He also asks if anyone else has had contact with her, as blood, bites, or scratches can spread the curse. No one admits to anything. In another room, Tove attacks Markus. Gunnar enters and shoots her. Tove jumps out the window and Gunnar follows her. Simon insists on leaving while Albin phones the police. Linnea goes with Simon to wait for the police by the cars. Simon first stops at a shed he noticed earlier to take an axe and a shovel. Inside, he and Linnea discover a pile of dead birds that ate each other. Tove attacks Gunnar in the forest. She bites him, but he is able to cut off her head following a struggle. Knowing that he is now infected, Gunnar goes to the shed and shoots himself. Simon notices that Linnea’s eyes are pooling with blood. He kills her and buries her in the ground as a rainstorm begins. At the cabin, Markus becomes sick. Ida realizes that Marie is gone. Marie suddenly reaches into the window from outside and pulls a clump of hair from Albin’s scalp. After throwing a rock to break the remaining glass, Marie then climbs inside. Ida and Albin both stab her, but Marie spits blood all over Ida. When Marie reanimates and attacks Albin, Markus impales her head with a metal pole. After she fights off Markus, Albin then takes the rock that she used to break the window and beats Marie to death. As Ida and Albin make a plan to leave, Markus reanimates into a creature and chases the couple upstairs. Simon returns to the house and finds Ida and Albin barricaded in a bedroom. Markus tackles Simon and Simon tumbles through the window and onto the ground outside where he is attacked by a reanimated Linnea. Albin hits Markus with a fire extinguisher so that he and Ida can make a run for the woods. Linnea comes into the house and Albin hacks at her with an axe. He and Ida then take refuge in another room. While Markus breaks down the door with an axe, Albin breaks out the floor and falls to the next level. Ida jumps down after him and finds that Albin is injured. Markus also jumps down, but he is impaled on an overturned stool. Ida looks for another exit and comes face to face with Simon, who beats her with a pole and spews blood into her mouth. Markus reanimates and Albin takes him out with a sledgehammer. Albin goes to the shed and retrieves Gunnar’s shotgun. Simon follows him. Albin then shoots a hole in Simon’s head. Albin finds Ida wounded and has an emotional breakdown. After she turns, Albin kills Ida by overturning a bookcase on her. Albin discovers the door in the floor and the original creature emerges. Albin avoids looking directly in her eyes. Albin stabs the Vaettr and overturns the refrigerator on her. Every other article written about “Wither” has drawn that same comparison, and rightly so. Seven friends set out for a remote cabin in the woods to party away the weekend. But one of them opens a door in the floor and unleashes an ancient curse. Each person then takes a turn becoming demonically possessed before being dispatched in suitably gory fashion while the evil entity claims another host. The only things missing from the storyline are a skin-bound Necronomicon and a Bruce Campbell cameo. Since no new ground is being broken on the story front, “Wither” focuses its resources on what it can do well, which is creating copious crimson colored geysers spraying liberally from gruesomely severed limbs. A pocketknife decapitation, a bitten off upper lip, and a body impaled on the legs of an overturned stool are a few of the outstanding makeup effects that keep the movie’s motor running. Every time the routine plot stirs up boredom, a violent axe swing or gunshot blast that stifles the urge to yawn is often close behind. Hair matted with mud and reddish-brown blood compliments cataract-colored contact lenses for a familiar look to the creepy creatures that is somehow unique at the same time. 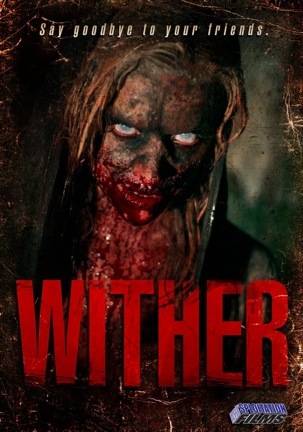 If “Wither” put as much passion and creativity into the script as it did into the visual horror, it would be memorable as something more than a Scandinavian “Evil Dead” clone. With the slice and dice symphony of destruction picking up the entertainment ball dropped by the lack of originality, many of the movie’s transgressions can be overlooked. Although there can be too much of a good thing as even the most forgiving gorehounds will find “Wither” trying their collective patience. The flimsy backstory involves a Swedish legend about a creature that possesses a person Medusa-style if someone holds its gaze for too long. As the premise is already paper thin to begin with, “Wither” makes the mistake of overstaying its welcome by carrying on for too long. With a roster seven campers deep plus an additional huntsman, the daisy chain of possession – kill – new possession – kill – new possession – etc. has at least two too many characters among its links. Pare down the cast, chop the runtime from 95 to just 80 minutes, and “Wither” would be much easier to swallow as a hollow yet entertaining piece of gore-fueled horror. The film runs out of gas when the latter half overindulges in redundancy. Even the last two kills are executed in the same manner, as if “Wither” itself realized that it was overstuffed with bodies and out of ideas for their elimination. “Wither” has its moments, although Laguna and Wiklund ought to break out of their continued pattern of relying on secluded cabins populated with blood-soaked axe-wielders for their next project. Emulating other films or a proven formula is fine for a launching pad, but not as a continued crutch. Even if it is the redheaded stepbrother of “Evil Dead,” “Wither” should still be welcomed as part of the family and it therefore deserves at least a small place at the dining room table. Or maybe just a seat at the folding card table off to the side reserved for the less mature party guests. September 3, 2013 by Ian Sedensky.